For over 75 years Duke University Health System has built a reputation of innovation and excellence. Duke University Medical Center is ranked as one of the nation’s top ten health providers in 15 adult specialties per US News and World Report. Duke University hospital is Magnet and JACHO certified with specialty certifications from JACHO in Stroke and Ventricular Assist Devices. We are a CF certified center and Level I trauma center. Our highly skilled and trained staff is committed to providing outstanding care in combination with your primary care and specialty care providers. We work closely to address your needs and to incorporate your goals in developing a customized treatment program to maximize functional independence and facilitate recovery. Duke is a teaching hospital with the vision and mission of promoting excellence and innovation in clinical service, teaching and research. We support this mission as we continually host 4-6 physical and occupational therapy students throughout the year. Our department offers the nation’s first APTA credentialed residency in Cardiovascular and Pulmonary physical therapy. Duke’s Total Joint Program focuses on the rehabilitation of patients after hip or knee replacement. Care begins with an interdisciplinary pre-operative educational class. The class helps prepare patients for their surgery, hospital stay, and discharge. Total Joint patients are often seen on day of surgery to begin rehabilitation process to expedite their return to independent daily living. Free-vascularized fibular graft (FVFG), a procedure for the treatment of avascular necrosis (AVN) of the hip, was pioneered by a Duke surgeon. 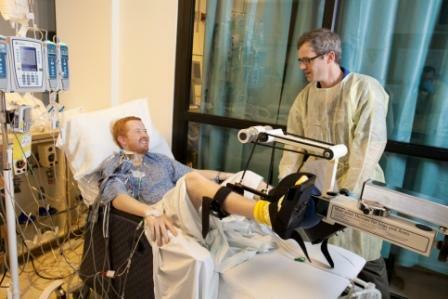 Duke is also one of the few places where Isolated Limb Perfusion is performed to treat Malignant Melanoma. After this procedure, Occupational Therapy and Physical Therapy will help you regain use of the leg or arm to avoid potential complications. AV Fistula placement for Dialysis access. Amputation: Therapy plays an important role in the care of the amputee to avoid joint tightness, resume mobility and ADLs in preparation for eventual prosthetic fitting. Therapy places an emphasis on exercise tolerance and instruction in compensatory strategies for energy conservation. We also incorporate other airway clearance techniques such as the therapy vest, acapella, and active cycle breathing. We have a daily pulmonary rehabilitation group for pre and post lung transplant patients as well as a relaxation and stretching class twice a week to aide in stress management. 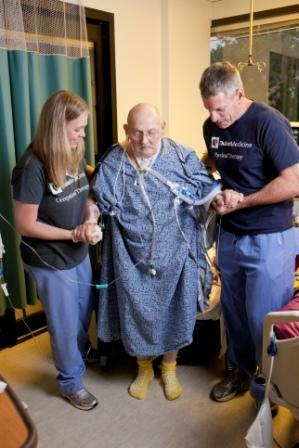 The physical therapy team at Duke Hospital is one of a handful in the nation that continues to perform manual chest physical therapy (CPT) for the management of pulmonary secretions. 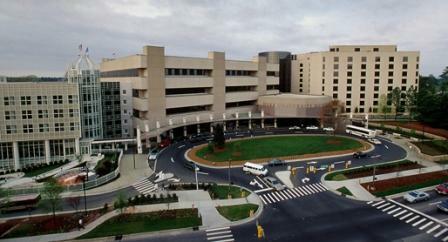 Duke Hospital is an accredited Stroke Center. Our therapists have been trained to apply the NIH stroke scale into their practice and implement standardized tests such as the Short Blessed Test, Tinetti, and Berg to guide treatment intervention strategies. Patients on our Bone Marrow transplant unit have access to their own personal gym and are closely supervised by our team. We have an incentive C.O.R.E. program (controlling our rehabilitation through exercise) that encourages our patients to engage in their rehabilitation on a daily basis in order to promote an increase in self care activity as well as physical exercise both during and after a bone marrow transplant. 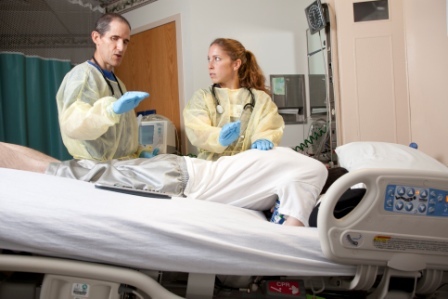 Duke Hospital Wound Management Center provides wound care services to all specialty areas and units of the hospital. Our team partners with vascular, orthopedic, diabetic, pain management, and plastic surgery specialists to identify standards of care, develop more effective wound therapies, and improve patient outcomes. Our physical therapists are certified wound specialists who provide bedside pulsed lavage for wound irrigation and debridement, dressing changes, excisional debridement, and therapeutic interventions. Lymph node disruption can occur as a side effect of surgical and/or radiation treatments which can cause excessive swelling in the extremities and genitalia. Duke’s Center for Hyperbaric Medicine has been in the forefront of research and treatment over the past thirty years. It also has a unique partnership with the Diver’s Alert Network, which provides emergency assistance and evacuation after diving accidents. Physical Therapists are involved in the hyperbaric chamber to assist with the treatment of patients with Pulmonary Alveolar Proteinosis (PAP). Treatment may entail a whole lung lavage, where one lung is repeatedly washed with a mild salt solution while the other lung is ventilated with oxygen. During the lung lavage, a therapist performs focused chest percussion to loosen any surfactant. Afterwards, the therapist will follow-up and instruct on airway clearance techniques. 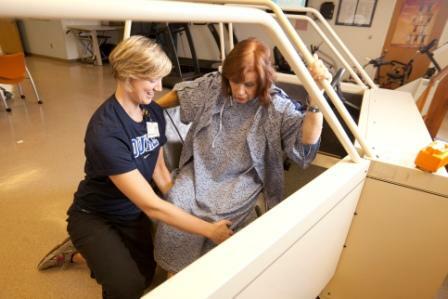 Occupational Therapists at Duke Hospital provide care in joint positioning and protection. Therapists fabricate protective and positional devices with low temperature plastic materials. Customized splints are created to support extremities after major trauma or extensive plastic or orthopedic surgery. Duke inpatient therapists also have direct access to our certified hand therapy team for consultation with more advanced dynamic splinting. Our physical and occupational therapists provide intervention and early mobilization to patients in the ICU to expedite recovery and maximize long term physical and cognitive abilities. Early ICU mobility is associated with statistically significant shortened days in bed, reduced ICU and hospital length of stay for hospital survivors, without increasing hospital costs. 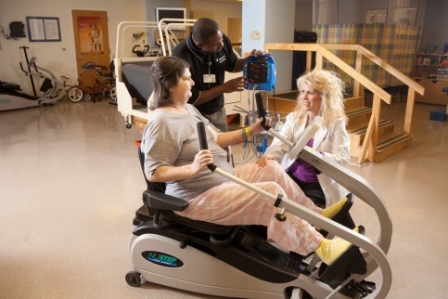 Early Intensive Care Unit Mobility: Future Directions Morris PE, et al. Crit Care Med 2008; 36:2238–2243.